Welcome to Mont Sky Real Estate! Getting started as a new real estate agent in NYC will be so much easier if you diligently read through all of our training materials and master the content. Even though Mont Sky Real Estate is unique in allowing new agents to work on exclusive sale listings and buyer clients directly with management, it is important to realize that in order to make a full time living in real estate you must ultimately source your own clients. You should view the ability to work with management together on our sales clients as a great opportunity to get your feet wet and learn the business. However, the end goal should be for you to build your network and learn how to convert off market and FSBO sellers, maximize conversions on buyer leads and purchase leads online. To get started, we’ll need to make sure you’re licensed with us. Please log on to eAccessNY several days after you’ve taken your state exam to see whether if you’ve passed. If you have, congrats! Please apply for a real estate salesperson’s license directly on eAccessNY. You’ll need to submit the license number for Mont Sky Real Estate LLC which is 10491206002. Please let us know after you’ve done this so we can “Authorize Initial Salesperson License” online from our eAccessNY account! Are you changing brokerages? Please email us your license number so we can associate you in the NY DOS database after you’ve disassociated from your current brokerage. It may take up to 48 hours for you to become fully disassociated from your former brokerage before we can associate you in eAccessNY. Reasonable commission splits and a chance to work on sales leads upon joining! 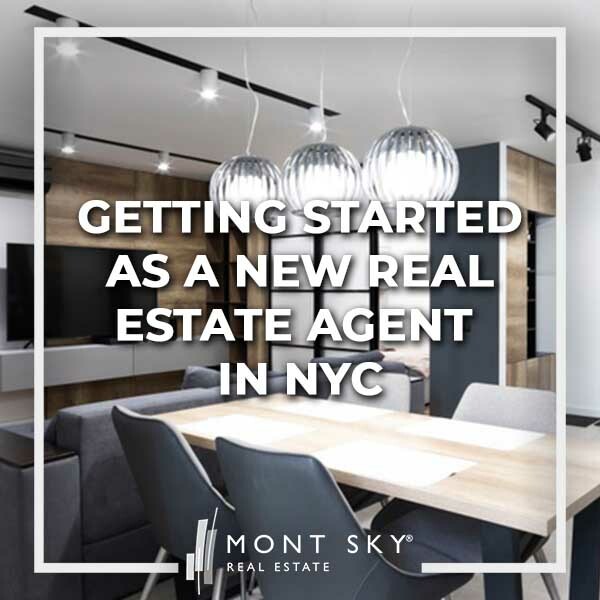 Getting started as a new real estate agent in NYC has never been easier. Traditional brokerages have always maintained that a new agent needs to spend years in the tough rental business before taking a shot at sales. Skip the wait and start in sales immediately at Mont Sky! We’ve emailed you an industry standard independent contractor agreement for e-signature. Please take care of this as soon as possible as this establishes the relationship between you (independent contractor) and Mont Sky Real Estate LLC. You’ll want to note that the commission split referred to in the agreement is for your own independently sourced and executed deals. The split percentage is quite favorable to you versus the industry norm of allowing new agents to keep 30-50% or less of their own commissions. You’ll also note that we are as transparent as possible when it comes to fees. There are no hidden fees or charges such as start-up fees, software fees, insurance fees, transaction fees or technology fees. Unlike other firms that offer higher commission splits, our business model is not predicated on nickel and diming our agents with secret charges. Mont Sky generates a lot of leads and referrals organically, and our success is based on your success in closing our deals and your own. Mont Sky Real Estate runs a paperless operation. Everything we do from document signing, scanning and sharing to team messaging is online and mobile friendly. To get started, please download and install our team secure messaging application called Telegram. You should download this both on your smartphone as well as your desktop or laptop computer. Management will have a private chat room with each agent and you will also be invited to join a group chat room with all of our agents. This is the fastest and most efficient way to reach us should you have an urgent question. Next, please set up your corporate email account per the email instructions you’ve been sent. Please remember to set it up ideally in your native email application on your smartphone as well. REBNY is the main real estate professional trade association here in New York City. REBNY operates the New York City equivalent of the MLS (Multiple Listings Service) database which is called the RLS (REBNY Listing Service). It’s necessary for new agents to join REBNY within 90 days of associating with Mont Sky Real Estate because we are a REBNY Member Firm. This is important because of stiff penalties that REBNY can impose on both you and us for not complying. The annual dues for a salesperson range up to a few hundred dollars and should be paid directly to REBNY. Create a HelloSign account with your corporate email address and send us your completed REBNY application for e-signature! Then simply email your signed and completed application to REBNY! Send us a short biography for your agent profile and set up your agent accounts on Zillow, Trulia, StreetEasy etc. Your biography should be a paragraph or so in length. Be creative but professional, there are no rules on what you can write! Your biography will be listed in your agent profile on our website. You should also post your biography on your StreetEasy and Zillow/Trulia profiles after you have set up agent accounts with these popular real estate search websites. For StreetEasy, you’ll need to email them to request an “Agent Tools” account. It’s critically important that you set up your profiles online especially if you are going to be working on a listing with us. If you do not have an account set up, it will be much harder for buyers to directly contact you. Furthermore, it looks completely unprofessional to have an exclusive sale listing online but no profile set up. You should also upload your professional headshot after you’ve taken it with our team photographer. Please take care of your first invoice as soon as you receive it from us by email. You can set up recurring monthly payments by credit card for your convenience. Because of the significant time and monetary investment we are putting into you, we will need to see commitment from your end as well. Please take care of this before we proceed further! You’ll receive a standard business card design from us within 5 business days of joining. If you would like a different phone number on your business card, please let us know as soon as possible. Where and how to print them is up to you! Please reach out to us immediately after you’ve taken care of your first month’s dues to schedule a session with our team photographer who will take a professional profile photo for you. We will provide you with her contact information and it’s up to you to schedule directly with her. It’s important to work with our team photographer as she will produce a photo that will be similar in style to our other team members, and because her photos simply look great! Nestio is a 3rd party software provider and “RLS vendor” we currently use to access the RLS property database, syndicate listings to the RLS and other websites from one place, and keep track of our client contacts (optional). When you’re searching for listings for buyers, it’s important to understand that Nestio is a portal to view all the listings in RLS (i.e. listings by other REBNY Member Firms which are automatically co-broked). It may not be as comprehensive as some public real estate search websites such as StreetEasy, but you can be assured that all of the listings in RLS will automatically pay us commission for bringing a buyer. Nestio is also a great tool for agents to post open listings on landlord rental listings. Please sign up for Nestio’s webinar training sessions as soon as you’ve been emailed an account set up invitation. Don’t hesitate to email or call Nestio support should you have any questions! I can’t wait to begin my career in real estate. I enjoyed learning the steps to take to begin working. I will begin following the process to begin working. The company seems to be great and I am very happy to be a member.